Saturated fat can raise harmful cholesterol levels that may eventually clog the arteries. Animal protein foods, such as meat and dairy, contain these fats, but plant foods, including coconut and coconut oil, can also contain saturated fats. Reducing your intake of saturated fat helps maintain healthy cholesterol levels to decrease your risk of heart disease. Although many people may think animal protein foods have more fat than plant foods, the high amounts of saturated fat in coconut oil still make it worth considering when seeking to reduce your fat intake. Too much low-density lipoprotein, or LDL, cholesterol forms plaques on the inner walls of the arteries, interfering with normal blood flow to the heart. The plaques narrow the arteries and may lead to arteriosclerosis, or hardening of the arteries, and contribute to heart disease. The plaques may burst, completely blocking the arteries and causing heart attack or stroke. LDL has been called the "bad" cholesterol because it builds up plaque and fatty deposits in the arteries. Saturated fat raises LDL cholesterol. Saturated fat in the American diet comes mainly from red meat, poultry and dairy products. Other than coconut and coconut oil, plant foods containing saturated fat include palm oil, palm kernel oil and cocoa butter. The American Heart Association recommends limiting your total fat intake to less than 25 to 35 percent and your saturated fat intake to less than 7 percent of your total daily calories. Trans fat, found in some packaged snacks, processed foods and fried foods, should be limited to less than 1 percent of your total daily calories. Monounsaturated and polyunsaturated fats, known as the healthy fats, can provide your remaining fats. These unsaturated fats come from nuts, seeds, fish and vegetable oils. Replacing coconut oil with olive, peanut or canola oils helps to reduce your saturated fat intake. Olive, peanut and canola oils contain high concentrations of monounsaturated fats, which help lower LDL cholesterol, according to the Harvard School of Public Health. Monounsaturated fats may also raise high-density lipoprotein, or HDL, cholesterol. HDL, known as the "good" cholesterol, clears away excess cholesterol in the bloodstream and takes it to the liver for disposal. Oil from coconuts contains about 85 to 90 percent saturated fat, according to ABC Health & Wellbeing, the Australian Broadcasting Corporation's health site. Coconut oil and meat differ in the amount and type of fatty acids they contain, but the fats in coconut oil still raise LDL cholesterol. 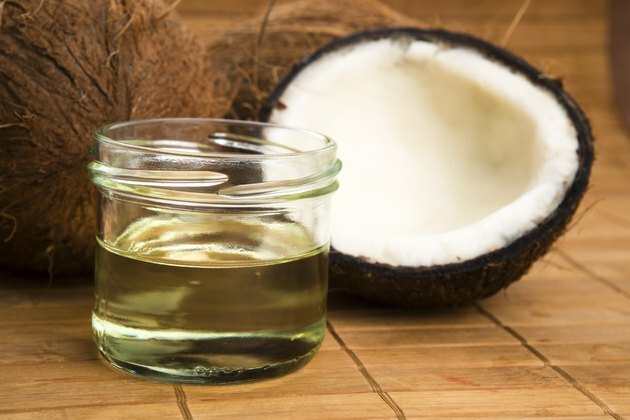 Coconut oil may raise healthy HDL cholesterol, but not as much as unsaturated fats do. You can reduce a good portion of your saturated fat intake by consuming lean meat with all visible fat trimmed off, skinless poultry and low-fat or nonfat dairy products. Watching your intake of coconut oil may provide further protection from harmful cholesterol buildup.